The majority of this trip is on good paved roads with only a slight percentage on dirt roads and trails. There are some challenging climbs on easy angled switch-backs, mind blowing descents that last for hours and all of these through some of the most beautiful and unspoiled scenery in the world. As we traverses along this single track road, we accumulate a total of 15,000 meters of ascent and a mind-boggling 20,000 meters of descent, whilst crossing ten major passes. The traverse of Bhutan, which has been completed by only a handful of foreigners, has now gained acceptance as one of the great cycle journeys of the world. You have to ride it to believe it! Flying into the country’s only airport, in the beautiful Paro valley, the clear mountain air, forested ridges, imposing monasteries and welcoming Bhutanese people in their striking national dress, provides a breath-taking first impression. Your guide who is going to be with you throughout your trip will meet you at the airport. A fifteen minute drive follows the narrow winding road to our hotel which is a traditional Bhutanese building with attractive gardens and an exceptionally peaceful atmosphere. We have some time before dinner to put our bikes together, in preparation for the start of our journey. Altitude at Paro – 2250 meters. Our destination today is the Bhutanese capital of Thimphu, which is 110 ks from Haa. Thankfully this is all on a good and fairly level road-with very little traffic. We start out very easily for 40 ks we follow the Haa river gently downhill. We head towards the southeast and then northwards to a junction with Bhutan’s main east-west highway at Chuzom (2068m). Incidentally, the road from Paro also meets main highway here. From here, we follow the Thim Chu upstream through a mixture of rice fields and coniferious forest. We find a suitable wayside spot for a lunch stop and then continue, via a narrow gorge section and a widening of the valley at Namseling. Finally, the quaint suburbs of Thimphu begin to appear and we see the impressive Simtokha Dzong in the middle of the valley and turn northwestwards into the Thimphu valley. Thimphu is the only large settlement in Bhutan and is spread out across a wide valley. Thimphu has a special charm and it is fascinating to sit and watch a gathering of local people in the town square, wearing their traditional dress and going about their business in a typically unhurried Bhutanese way. We check into our hotel and enjoy a well-earned beer or coca cola at the bar. Altitude at Thimphu – 2380m. A long day of 7-8 hours biking (approximately 110ks). The Central Road across the Black Mountains was completed only 20 years ago and its completion brought about great changes to the people of central Bhutan. We leave our hotel and cycle down to the river and the valley bottom, one of the lowest points of the trip at 600 meters above sea level. Crossing the bridge, we have a short climb to the village of Wangdi and then a relatively flat road for 20 kilometers to a bridge across the river just past the village of Tikke. We stop for a tea break and then begin a long climb over the Black Mountains. This is a deceptively long climb, gaining almost 2000 meters, to a junction with the side road to Gangtey, a few kilometers beyond Nobding. Crossing the pass, we descend into the Phobjikha valley, which is one of the few winter homes of the black-necked crane, which migrates here from the Central Asiatic Plateau in November. A short descent leads into the valley and to our hotel a few kilometers beyond the small village of Gangtey, whose houses are clustered around the monastery. Altitude at Gangtey : 3000 meters. Ride time : 8 to 9 hours. If the black-necked cranes have arrived, there are often between 250 and a 300 in the Phobjikha valley and from our hotel, close to their feeding grounds, we are woken by their distinct calling. These birds are tolerant of people and regularly feed near human settlements and domestic livestock, perhaps because local religious beliefs protect them across much of their range. Moving on from this fascinating spectacle, we head eastwards once again, continuing our climb to Pele La (3300m). There is a good chance that we will see langur monkeys in the forest on this section of our ride. At the pass, the forest opens out a little and we should find yaks grazing by the side of the road. Looking back from the pass, it is possible to see Jhomolhari (7219m). The pele La is the third of our big passes and by now we should be getting used to the climbs. This pass is traditionally known as the boundary Western and Eastern Bhutan and the landscape which spreads out on the far side of the pass is different to that on the western side. Another amazing descent follows (1530m). It is downhill almost all the way for 60 kilometers to Tongsa. We take our lunch at Chendebji, a magnificent Stupa built to ward off the demons of the valley. After crossing a bridge at Nikachu, we enter Tongsa district and follow a dramatic section of the road, carved into the side of a cliff, high above the Mangdechu. The scenery is beautiful – forest as far as the eye can see and with Tongsa Dzong visible from 30 kilometers away, at the end of the valley. Tongsa means “new village” – was founded in the 16th century, which is relatively recent for Bhutan! After so much downhill riding, beware of the final 300m climb up to Tongsa Village – it can catch you out! If we have time in the afternoon we will take a look around the Dzong, which is situated on a spur over the Mangdechu, with a commanding view in every direction. Altitude at Tongsa : 2200m. Ride time : 5 to 6 hours. The road climbs rapidly through a series of hairpins out of Tongsa and there are great views back to the Dzong and out across the valley. After passing through cultivated fields for a while, we re-enter the forest and at a distance of 30 kilometers from Tongsa we reach the Yutung La (3400m). Descending to a low point of 2650m at a village called Chumey, the scenery is once again totally different as we enter the wide-open Bumthang valleys. After a short climb to Kiki La, we turn a corner for a great descent to Jakar. From almost 20 kilometers away we can see Jakar Dzong, high above the village. Altitude at Jakar: 2600m. Ride time: 7 to 8 hours. The height gain of 900 metres to our fifth pass, the Shertang La, is achieved after almost 40 kilometres of biking. The Ura Valley, on the far side, is the highest of the Bumthang Valleys. Extensive sheep pastures line the road and just before the pass there is a panorama of the mountains of Lunana to north. We descend from the pass by long loops, through pastureland and fields to Ura village. Here, we camp on one of the few flat places in the valley. Altitude : 3000m. Ride time : 6 to 7 hours. Bhutan’s highest road pass! Today is a long day and if we wish to cycle the whole way, we need to set off at first light. After a short descent to a bridge, we start climbing immediately to the Thrumshing La (3800m). The ascent, over 30 kilometers, is quite gradual and the scenery is stunning, as we pass through dense forest of conifer and rhododendron. The climb is actually split into two parts as there is a minor pass on the way to the Thrumshing La, followed by a short descent to a bridge across a river. The pass marks the last of our high altitude climbs. We have lunch( and a celebratory toast!) on the pass before setting off on what must rank as one of the most enjoyable and breath-takingly beautiful descents in the biking world. From the pass, the road plunges 3200m to the valley floor at 600m. The whole descent, over 85 kilometers, passes through dark conifers, then a mixture of deciduous and conifer woodland, before entering the semi-tropical zone at an altitude of around 1800m. Bamboo and an array of rare plant life lines the sides of the road, but no doubt everyone will be too involved in the dizzying descent to notice! The 20 kilometres between Sengor and Namling has the reputation for being the most hair-raising section of the road across Bhutan, but is just perfect for mountain bikes. Hewn out of the side of a cliff, and above a vertiginous drop for most of the way, this is the most exhilarating part of the trip. By the time we reach Lingmithang, the temperature will have risen considerably and we will feel as if we have arrived in the tropics. After 5 hours and 85 kilometers of solid “fun downhill”, most people will be simply speechless. 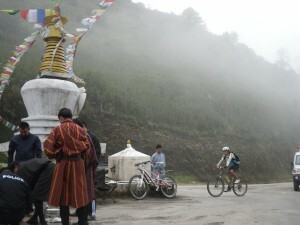 The sting in the tail is a final 20 kilometers climb to the village of Mongar. Altitude: 1600m Ride time : 12 hours. Another great descent in store for us today, but first we have a further 20 kilometers of our climb to finish, en route to the Kori La(2400m), the first of two relatively minor passes. The road then descends rapidly through cornfields and banana groves and after 10 kilometers reaches the start of the famous hairpins at Yadi(1500m). Thirty kilometers of interminable bends later we arrive at a bridge across the Sheri River at 600m. This has been the second longest descent of the trip, a sparkling 1850m! Back in the hot tropical climate, we can enjoy a very pleasant ride along the side of the Gamri River to the bridge and check post below Tashigang. 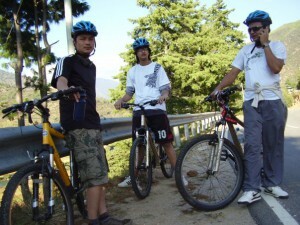 A steep 10 kilometers climb finishes off quite a hard day’s biking. Tashigang sees very few tourists and facilities are limited, but we stay in the best place in the town which is in reality a very basic lodge! Altitude : 1100m Ride time :7 to 8 hours. We have now reached the most easterly point of our journey as the road now heads south for 200 kilometers to Samdrup Jongkhar, Bhutan’s eastern road border with Assam. This day is another tough one and often catches people out, being so close to the end of the ride! At first we have a hot climb for 30 kilometers to the university at Kanglung, then continue for a further 10 kilometers to a small pass at 2450m, with views of the peaks of north-eastern Bhutan and Arunachal Pradesh. From here it’s downhill till the village of Khaling, which is famous for its weaving and handicraft. We camp 10 kilometers beyond the village on one of the few flat spots in the valley! Altitude:2100m. Ride time:10 hours. We climb to another minor pass at 2450m, before descending to Wamrong (2000m) where there is a check post. Unlike western Bhutan, where the road goes over passes between one valley and the next, the road here follows ridges almost the whole way and is marked throughout with stone chortens. A long climb, with the road switching from left to right, across the spine of the ridge, leads to the high point at 2450m and then down through two small settlements to a point where we can safely say that there is no more uphill! The road descends rapidly to the plain through a dense tropical forest with an abundance of teak and bamboo. We re-group at the village of Dewathang where there is a large memorial chorten dedicated to those who lost their lives building the road across Bhutan. A few kilometers beyond the village lies the Bhutanese frontier check-post and a few kilometers beyond that, at the precise point where the town of Samdrup Jongkhar. We cycle to the border gate for photo’s and then return to our hotel in town. We re-pack our bikes for the journey home and have dinner. A small celebration will certainly be in order as you will be one of only a tiny handful of people who have completed what is arguably the most beautiful and challenging bike ride in the world.